The campaign, held annually since 1987, will launch in March with a goal of $830,000. Polly has been a member of Butler Snow’s commercial litigation group since 2015, with an emphasis in commercial litigation, civil rights, professional liability and general litigation. Before joining Butler Snow, Polly spent 13 years as a partner at Nashville law firm Walker, Tipps & Malone. Polly is a graduate of the University of Tennessee College of Law, where she was president of the Student Bar Association and received the dean’s citation for extraordinary service to the College of Law. Before law school, she earned a degree in political science and government from Maryville College. 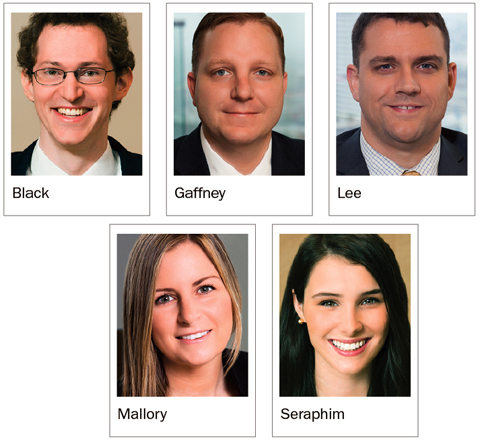 Bass, Berry & Sims has hired five attorneys to the firm, four in Nashville and one in Washington, D.C.
Noah R. Black, associate, assists clients with the design, implementation and administration of qualified benefit plans, health and welfare benefit plans, and deferred compensation packages. He previously worked with the U.S. Department of Labor in the Employee Benefits Security Administration. He earned a J.D. from Cornell Law School and a B.A. from Rhodes College. Nicholas D. Gaffney, associate, represents clients in the areas of estate planning, taxation, business planning, and estate and trust administration. Gaffney earned an LL.M. in taxation from the University of Florida, a J.D. from the University of Florida Levin College of Law and a B.A. from DePauw University. Ryan A. Lee, counsel, advises clients in various construction-related litigation matters, such as disputes related to contractor licensing, design and construction defects, mechanics’ and materialmen’s liens, and Prompt Pay Act and other payment issues. He previously worked at the Tennessee Attorney General’s Office as an assistant attorney general in the Financial Division where he handled complex public finance and investment transactions including serving as regulatory counsel for the state of Tennessee’s retirement systems alternative investments in private equity, strategic lending and real estate. He earned a J.D. from Chicago-Kent College of Law and a B.S.E. from Princeton University. Laura M. Mallory, associate, represents employers in all aspects of labor and employment law advising companies on a variety of employment matters and providing counsel on compliance with state and federal employment laws, hiring and termination policies, drug testing, and other employment related issues. She previously practiced in the Nashville office of King & Ballow and in New Jersey at the law offices of Weiner Lesniak LLP. She earned a J.D. from Seton Hall University School of Law and a BGS from the University of Michigan. Olivia Seraphim, associate, Washington, D.C., health care clients in government actions, investigations and related litigation arising from fraud and abuse allegations brought under the False Claims Act (FCA), Anti-Kickback Statute (AKS), the Stark Law, Medicare and Medicaid reimbursement rules, and various other federal and state healthcare statutes and regulations. She earned a J.D. from The George Washington University Law School and a B.A. from the University of California, Santa Cruz. Lauren Poole, an associate attorney at Taylor, Pigue, Marchetti and Blair PLLC, has been named 2018 Nashville Bar Journal Contributor of the Year. The award recognizes a Nashville Bar Journal committee member who went beyond the call of duty to ensure the success of the publication. Poole, who was recently named co-chair of the Nashville Bar Journal Editorial Committee, practices civil litigation, including bankruptcy and creditors’ rights at tpmbLAW. Poole earned degrees in political science and studio art from the University of Tennessee, Knoxville. She earned her J.D. from Belmont University College of Law. Consuelo Wilkins, M.D., MSCI, associate professor of Medicine and executive director of the Meharry-Vanderbilt Alliance, has been named to the newly created positions of vice president for health equity at Vanderbilt University Medical Center and associate dean for health equity with the Vanderbilt University School of Medicine. As Wilkins assumes these new roles, the Meharry-Vanderbilt Alliance will continue to report to her. A new executive director will be recruited to lead the Alliance. In the role overseeing the newly established Office of Health Equity, Wilkins will connect existing community health and health equity initiatives from across the organization while scaling system-wide efforts to identify and address disparities in health. Prior to joining the faculty of both VUSM and Meharry Medical College in 2012, Wilkins served in a variety of roles of increasing responsibility at Washington University School of Medicine where she was an associate professor of medicine in geriatrics and nutritional science, psychiatry and surgery. There, she was a clinical investigator in Washington University’s Alzheimer’s Disease Research Center and was also involved in a range of community and public health initiatives including founding the Center for Community Health and Partnerships. Asurion has announced the promotion of Daniel Curling to senior vice president and chief information officer. He will report directly to Asurion COO Barry Vandevier. Curling is a five-year veteran of Asurion where he has been responsible for the company’s Enterprise Technology Services. Before joining Asurion, Curling spent nearly 10 years in senior leadership roles at Sabre Hospitality Solutions and Travelocity, where his accomplishments included delivering major platform and software upgrades, cloud migrations, and streamlining organizations and improving operations performance. Curling holds a degree in MIS from Texas A&M University and attended the Darden Leadership for Extraordinary Performance program at the University of Virginia. Fifth Third Bank hires senior commercial exec. Fifth Third Bank has hired David Briggs as a senior vice president and commercial middle market senior banker in Tennessee. In this role, Briggs will be responsible for leading a team of 13 commercial middle market relationship managers. Briggs has held a variety of leadership roles at banks in Nashville which include market president of Capital Bank, area executive of Bank of America and market executive of US Bank and Trust. He brings more than 25 years of experience in commercial, wealth management, business and consumer banking. Briggs most recently was the commercial real estate and corporate banking executive of First Tennessee Bank. Fifth Third Bank also has hired Caroline Harris as a vice president and treasury management area manager for Tennessee and Georgia. In this role, Harris will oversee a team of treasury management officers who provide customized strategies to effectively managed client’s working capital. Harris brings more than 25 years of financial services experience to the position. Most recently, she was a senior client advisor of working capital strategies at Regions Bank. Truxton Trust has hired M. Shannon Buckner, CFP, CTFA, as senior vice president and senior wealth advisor, adding more than 24 years of experience. Buckner previously was with SunTrust Bank Private Wealth Management, where he served as trust advisor and first vice president. He has earned degrees from Freed-Hardeman University, Belmont University and the American Bankers Association Trust Graduate School. He is a past board member of the Financial Planning Association of Middle Tennessee and member of the Middle Tennessee Estate Planning Council. 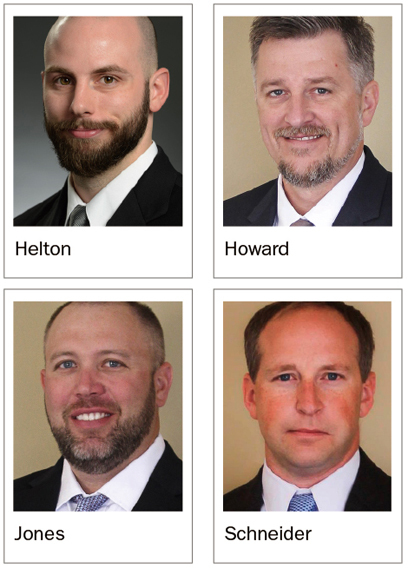 Messer Construction Co. has promoted Brian Howard, Tom Jones and Mike Schneider all to senior project executive and Josh Helton to senior virtual construction manager. Josh Helton joined Messer in 2013 after earning his associate’s degree in civil engineering technologies and bachelor’s degree in applied science in architectural engineering technology from the University of Cincinnati. Howard is a graduate of the University of Kentucky with a degree in civil engineering, Howard joined Messer full-time in 2000 after working as a co-op for three years. He has been based in Nashville since 2008. Howard has volunteered on the advisory board with the Academies of Nashville Public Schools for the past seven years and is an active member of AGC of Middle Tennessee. Jones joined Messer in 2002 after obtaining a degree in civil engineering from the University of Kentucky and has been based in Nashville since 2009. Jones’ building experience is diverse and includes higher education, health care, senior living, public, and transportation facilities. Schneider began his career with Messer as a co-op in 2002 after graduating from the University of Kentucky with a degree in civil engineering. Upon completion of his master’s degree in civil engineering the following year, he returned to Messer full time.